May is a good time to turn our attention to being more active. The weather is pleasant. The flowers are blooming. Outdoor festivals are plentiful. And it’s Bike Month. Throughout May, the North Central Texas Council of Governments (NCTCOG) is hosting the Try Parking it Bike Everywhere Challenge, open to all residents of North Texas. Through tryparkingit.com, the regional ride-matching and commute-tracking website, NCTCOG is asking commuters to choose their bikes for work, running errands and recreation. Awards will be presented in two separate categories: Most Bike Trips and Most Bike Miles Traveled. Three prizes will be awarded in each category. Participation in the challenge is easy. Residents must simply register for the Bike Challenge at tryparkingit.com, ride and record their trips on the website. Pedaling to the office is one way to participate in Bike Month. The region will celebrate Bike to Work Week from May 14-18, an annual event sponsored by the League of American Bicyclists that culminates with Bike to Work Day on May 18. 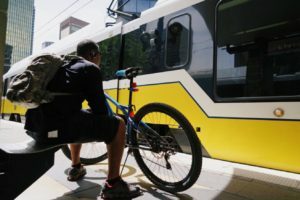 NCTCOG is partnering with Dallas Area Rapid Transit to provide assistance — and motivation — for North Texans to ride their bikes to work May 18. DART will set up energizer stations at select locations along its transit network, offering refreshments, encouragement and bike safety checks. NCTCOG staff members will be there to visit with participants and inform them about active-transportation opportunities. For a full list of energizer stations, visit dart.org/riding/biketowork2018. Not everyone lives close enough to bicycle all the way to work. Another option is combining bicycle and transit trips. DART, Trinity Metro and Denton County Transportation Authority all allow bikes on their buses and trains. Additionally, active-transportation connections to transit stations continue to make it easier for bicyclists and pedestrians to access the train or bus without having to drive. For example, a new trail bridge over Mockingbird Lane in Dallas provides a crucial link from the popular Katy Trail to the DART Mockingbird rail station. It is not even necessary for participants in Bike Month activities to own a bicycle. There are many bike sharing providers in Dallas, Fort Worth and other cities throughout the region offering residents the opportunity to rent bikes for short trips to the store, lunch, or to connect to transit. Students can also join in on the Bike Month fun. Bike to School Day is May 9, and significant investment is being made to help students bike and walk to school safely. For example, the Regional Transportation Council approved $12 million for 22 Safe Routes to School projects last year. With the growing list of options in North Texas, the hope is that residents will embrace active transportation for more than a day, week or even month. They can hit the street or trails on their bikes year-round. It’s a fun way to get healthy. For more information about Bike Month activities planned throughout the region, visit nctcog.org. Bicycle safety is also a major focus for NCTCOG. The Look Out Texans program provides residents with tips to help them bicycle, walk and drive safely. For more on the program, visit lookouttexans.org. The North Central Texas Council of Government is awarding prizes for biking in May. They will be presented in two separate categories: Most Bike Trips and Most Bike Miles Traveled. Three prizes will be awarded in each category.